Following a study a while back, researchers from Yale University concluded that delayed gratification is linked to intelligence. 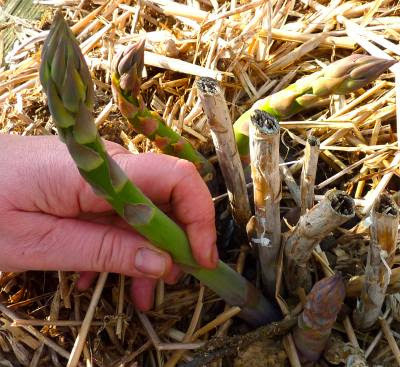 It’s been over two years since we planted our asparagus and this, their third season, is the the first time that we can harvest all spears. If the scientists at Yale are right, then all that patient waiting must make us very clever vegetable eaters indeed. You can’t do much better than simply steam them for a couple of minutes, then serving them with a large knob of salted butter—the type with salt crystals in the butter is particularly decadent. Gabrielle’s vegetarian and very “foody” daughter, Christina, is with us for a few days, so mum and daughter have since served up some more sophisticated and equally delicious asparagus dishes. Starting by steaming the asparagus again, then remove and set aside the tips. Blitz the stalks in a food processor, along with fresh cloves of garlic, crème fraîche, salt and pepper. Stir this scrummy goo into tagliatelle and then place the tips on top along with a grating of cheddar. 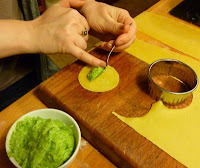 A variation on that theme: the blitzed goo, this time including the tips, is the filling for homemade ravioli. This gets boiled for a couple of minutes and served with fresh garden herbs and extra virginal olive oil. A topping on a veggie pizza (and also one incorporating some of our own chilli and fennel flavoured chorizo for the two carnivores). And for the last one—one of the best breakfasts I’ve ever had served up to me—words almost fail me: epicurean, ambrosial and nectareous, don’t fully convey the savoury scrumptiousness of this dish. 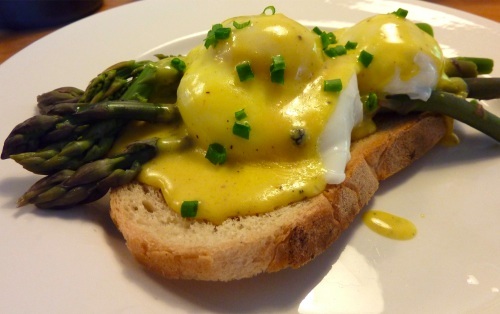 It’s a variation on eggs Florentine. Eggs Florentine is itself a variation on eggs Benedict (ham, poached eggs and Hollandaise sauce on a lightly toasted English muffin). The ham is replaced by spinach. In our version, “eggs Madennaise”, the spinach makes ways for steamed asparagus and, in the absence of English muffins, a slice of our local baker’s organic bread, toasted. … and whichever way you cook it, it does make your wee smell ! This really makes me lament the asparagus patch I established and then moved away from (what does that say about my intellect?) These recipes look delicious! 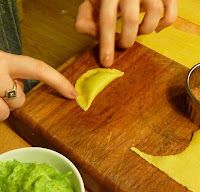 That looks really tasty but where do you get pasta flour 00 from in Brittany? Thanks for your comments and I'm sorry it's taken me so very long to post a reply. Firstly, "anonymous" I'm afraid that I can't hep you with the special flour as the neighbour who lent us the pasta machine also gave us a bag of pasta flour ... which he'd bought in England! And Eliza, you'll just have to prepare and plant another asparagus plant, you know it will be worth he effort! MMMM that looks so tasty. Unfortunatly our asparagus is only in its second year, but hopefully we will be able to pick some next year.